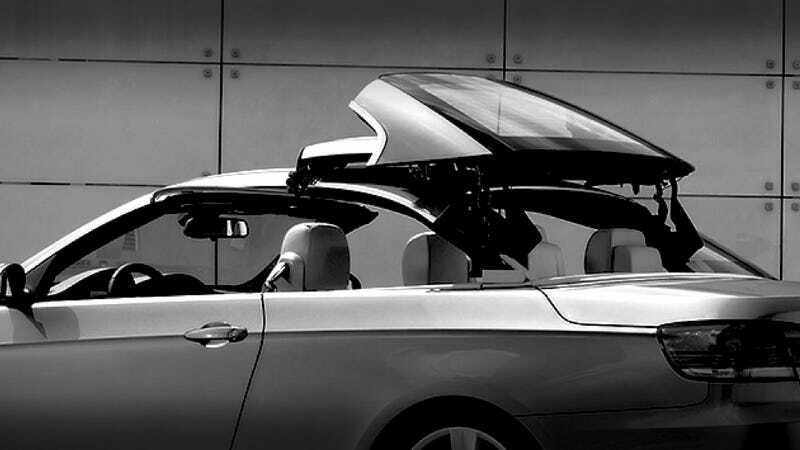 A 60-year-old maid in Lokeren, Belgium, was crushed to death yesterday when the folding convertible top on her employer's BMW mysteriously closed on top of her neck. Police believe she was cleaning the car at the time, which offers little solace or explanation as to how this can happen. Good morning world, meet your new phobia. If the car's folding top activated without any interference then BMW's got problems and, oh yeah, will you excuse me while I hide in my closet the next time I'm asked to drive one. Fortunately, this is the least likely scenario. The BMW was described as partially out of a garage, indicating she likely turned the car on and moved it for better access. If the car is on she could have engaged the folding top by leaning against the key or accidentally hitting the close button. Even if the folding and subsequent crushing isn't BMW's fault, the system should sense when there's interference and shut down. Let this be a horrifying lesson to everyone: don't put your head underneath a self-closing hard top mechanism.